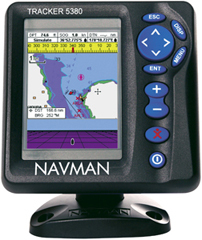 The Tracker 5430 and 5380 offer all the features and innovations which made the success of the Tracker range : GPS WAAS-EGNOS performance, C-MAP NT MAX cartography, daylight viewable colour screen or high resolution monochrome. Compact, ergonomic and fully waterproof, they come in 2 versions : with remote antenna or integrated ("zero profile") antenna. 3.8" (97 mm) TFT daylight viewable, high resolution display.